The ISSP system will come in one basic variant. 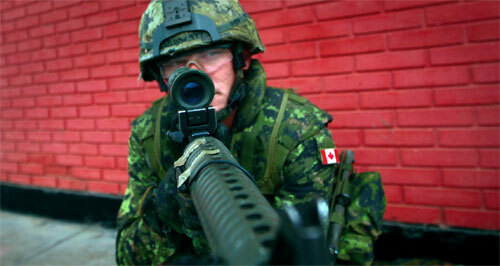 Canada is continuing its push to deliver the Integrated Soldier System Project (ISSP) programme. Although the goals remain the same there has been a reset in terms of how the capability will be acquired. The primary ISSP objective is still to provide the individual dismounted soldier with a state-of-the-art, digital, integrated system that greatly enhances his situational awareness and that adds no additional weight. Under current plans, the ISSP Request For Proposals will be released in Autumn 2011 with responses back by spring the following year and contract award following about a year later with the first deliveries scheduled for spring 2014. Other programmes remain lock stepped with ISSP, notably the Small Arms Replacement Project (which is to be renamed Small Arms Modernisation Project), the Sniper System Project and the Future Combat Uniform Project. In the case of the latter programme, while the camouflage scheme has been changed, the design of the clothing itself has remained the same for more than 40 years. The follow-on Soldier 2020 programme will retain its remit of updating whatever ISSP delivers. This is not the first reset. Canada's work on ISSP began in 1988 looking at a futuristic, exoskeleton-type product. 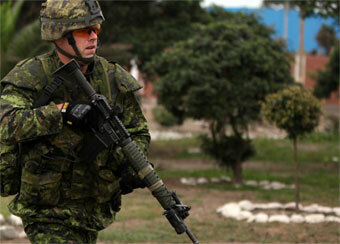 This then switched to the more currently recognisable Integrated Protective Clothing and Equipment solution in which a systems integrator was tasked with developing a soldier modernisation solution tailored to Canada's needs. This did not succeed. Amongst the principal insights was that a mechanism to integrate lessons learned was lacking and that more flexibility was also required from the contractor to better meet military needs. This prompted the project team to step back and embark upon a series of demonstration projects and other research activities to better understand the technology and why it should be given to the soldier. The Soldier Information Requirements TDP alone provided 60 such reports. Further research is continuing not least through the Soldier System Technology Roadmap. This is designed to identify mission critical technologies and a likely timeline for their potential inclusion. This is done in close co-operation with industry. “[That] is important to our project because it is something that … helps us understand what technology is available and when,” Lt. Col. Levesque said. “The roadmap is also far in the future and disconnected to any specific procurement activity, thus allowing a very frank and very open dialogue with industry”. The project team has placed a particular emphasis on power supply. A power and data bus is at the heart of the ISSP concept. Currently, each soldier has to carry a set of 15 AA and two CR123 batteries to step outside the wire. If they are to be on operation for over three hours, a further set is required and for more than 24 hours a third set is required. There is considerable wastage. Some soldiers discard every battery when the troops return to base irrespective of how long it has been used. Lt. Col. Levesque said that studies by Canada have found that 25 percent of the energy contained in batteries is wasted in this way. This research is backed up by findings in similar U.S. Marine Corps studies. Lt. Col. Levesque said, “45 double As in their pockets, just to be able to exist outside the wire, is a tremendously wasteful way to do business.” It is particularly wasteful in Afghanistan as these batteries have to be transported there and then convoyed to FOBs. ISSP is an Army project and there remains no buy-in from the Navy and Air Force as yet, although it is expected that boarding parties and security detachments will be equipped with Integrated Soldier Systems in the future. The ISSP system will come in one basic variant. Enhanced levels of technical sophistication, capacity and interoperability will be incorporated in future development cycles. The ISS will be procured and supported via the use of two different contracts: the Acquisition Contract for the integration, qualification and acquisition of the ISS followed by the Optimized Weapon System Support for long term support. In the programme's recent updated Mission Profile and Operational Mode Summary, issued in November 2010, the expected service life of the ISS will be 90 months (roughly 7.5 years) with 27,060 hours system operating life. The changes are important because they have enabled ISSP to align the delivery schedule more closely with user expectations. “The soldier might not get his power and data bus or he might not get his laser range finder in Cycle One, for example, but he is willing to accept a basic system. That has been a reset for us that has changed the time lines,” Lt. Col. Levesque said. What the ISSP is now looking for is a complete off the shelf integrated system that equates to the ‘Assaulter' role of the previous plan. This requirement is for a light weight, low volume and simple system, with a small tactical display, a radio and specific navigation functions. The radio unit will use an In-Ear rather than Over Ear Audio Display as a baseline with Over Ear for exceptions. The display unit or Tactical User Interface will consist of a touch screen and possibly an integrated keyboard with a very low light emissions capability for night operation, rather than Night User Interface capability. GPS functionality is now required for every ISSP system which will be delivered, either by integrating a SAASM GPS or using an in-service DAGR.